Medical equipment needs to be serviced according to official recommendations. You must ensure safety for patients as well as users. Nordic Service Group performs certified service throughout the Nordic region, including yearly maintenance, repairs, calibrations and installations. Many global and well-known brands have chosen Nordic Service Group as their official service partner. Medical equipment should be serviced according to manufacturers’ instructions. Usually, the operation manual informs the right service period of the device. Preventive maintenance typically includes an operational and functional check, electrical safety test and possible spare part change according to the manufacturer’s demands. During the service, we only use calibrated and traceable test equipment. Regularly performed service also extends the lifetime of the equipment. We know how important your equipment is. Depending on the situation, Nordic Service Group offers quick response times. We value great communication in our task to help you get your medical device working again. We do most repair services at the user site. 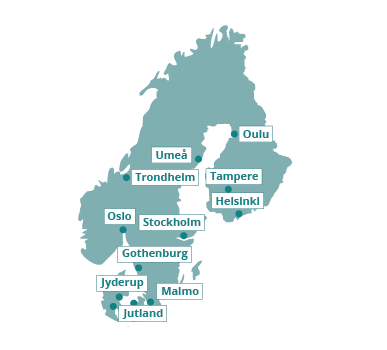 We also have more than 10 locations in the Nordic region with high-quality repair workshops. You may ship your medical equipment to your local workshop. We use only original spare parts during equipment maintenance and repair. We sell and deliver spare parts for medical equipment. If you are seeking only a correct spare part for your medical equipment, please contact your local Nordic Service Group office. ECG monitors and writers should meet safety requirements in regards to electrical safety. Maintenance must be performed to ensure functionality and safety for the different modules and possible wearing. Additionally, electrical safety tests, including earth leakage and connectivity, are also needed to ensure patient safety. Patient monitor service is important to ensure patient and user safety. During maintenance, the patient monitor is functionally tested and an electrical safety test is performed according to standards. Nordic Service Group is an authorized service organization for several patient monitor manufacturers. Service of anesthesia instruments is critical and should always meet the requirements from the manufacturer. Maintenance must be performed to ensure patient safety and to minimize breakdowns. Many parts wear down on anesthesia instruments, and it is important to do preventive maintenance. Respirators needs to be serviced according to manufacturer recommendations to ensure patient safety. Nordic Service Group is an authorized service organization for several Respirator manufacturers. In regard to medical device safety and performance, it is important that infusion pumps are regularly tested. This ensures that they are functioning to the manufacturer’s specifications and are within clinical and environmental expectations. Nordic Service Group is an authorized service organization for several infusion pump manufacturers. Visual check – chassis, labels, etc. Defibrillators need to be serviced according to manufacturer recommendations to ensure patient and user safety. Nordic Service Group is an authorized service organization for several defibrillator manufacturers. Electrosurgical units need to be serviced according to manufacturer recommendations to ensure patient and user safety. Nordic Service Group is an authorized service organization for several electrosurgical unit manufacturers. Laser surgery equipment needs to be serviced annually according to manufacturer instructions. It is important to ensure that the laser unit is working as the manufacturer requires. Nordic Service Group is an authorized service organization for several laser surgery equipment manufacturers. Patient warming systems need to be serviced according to manufacturer recommendations. Preventive maintenance ensures that patient warming system is safe for patients and for the people using the equipment.